Halfling friends, Randir and Fendi are part of a group of hunters who are searching for a wizard who can take them to the distant land of Vergash to retrieve the stolen Elven Jewel. They thought they knew what the quest would entail, but with an unexpected member and new enemies, not everything goes the way they had planned. Their quest leads them to many lands including the feisty and mysterious dragons' home. Halflings Fendi and Sienna and their bond fairies, could now discern what the elf and dragons’ keen eyes had already seen. The grasslands ahead were covered with thousands of Vergai, spread out in numerous camps across the West Lands, and beyond them, the outpost castle was just discernable in the early morning gloom. Bolts of lightning could be seen striking about the black fortress. As they sped closer, Fendi saw many giants surrounding the crackling portal. Dark shadows above the portal caused the Dragon leader to pull up abruptly from his rapid flight. 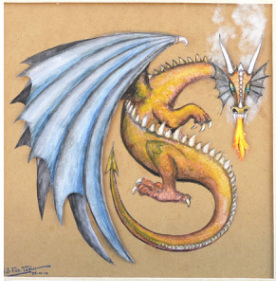 The dragons hovered high above the Vergai campfires. To the dragons’ surprise, a loud voice came from far above them, “Well, it’s about time you dragons joined the party. We have been here for hours, but can’t find a way past the lightning creatures and the giants. They keep pouring through the portal and we can’t get close to it.” It was Baja dwarf’s cheerful voice calling, but he sounded rather more serious than usual. They all looked up to see Heikki’s gnomish flying machine suspended above them, with their companions straining to look over the sides of the basket. With mighty beats of his enormous wings, the dragon set off towards the portal, leaving his companions behind. Fendi gave a cry of despair at seeing huntress Sienna valiantly clinging to the dragon's spiked neck. The other dragons followed the leader closely, with Fendi riding the plucky brown, and Daeron upon the large black. As they approached the castle, the halflings saw it was the same defensive design as the other outposts, but made of black rock. A fair distance in front of the castle was the portal, surrounded by giants and twelve strange lightning creatures. Fendi thought they looked a bit like large bloated toads, anchored to the ground in front of the portal by long thick ropes. Glowing antennae projecting from their foreheads were suspended before wide mouths. Every so often, one of the creatures burped and lightning crackled in all directions, striking the ground with a loud explosion. Fendi noticed that the giants stayed well clear of these lightning creatures and were positioned directly in front of the portal. The Dragon leader carrying Sienna reached the portal first and circled high around it, noting the portal could only be seen from the eastern side with no guards to the west. He surmised that the portal could only be accessed from one direction and he banked around to see the other dragons, hydra and wyvern, waiting for his lead. With wings beating strongly, the grey Dragon sped straight towards the lightning creatures, with the others bravely fanning out behind in a V formation. 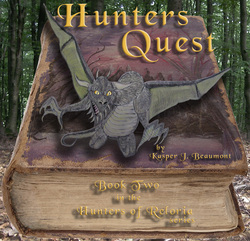 The story continues in Hunters’ Quest available on ebook November 2013.